After mixing 6 minutes on KitchenAid speed 4. Made pain de mie using the recipe from The Bread Bible by Rose Levy Beranbaum. It was great. Has a lot of flavour. I REALLY like that recipe. 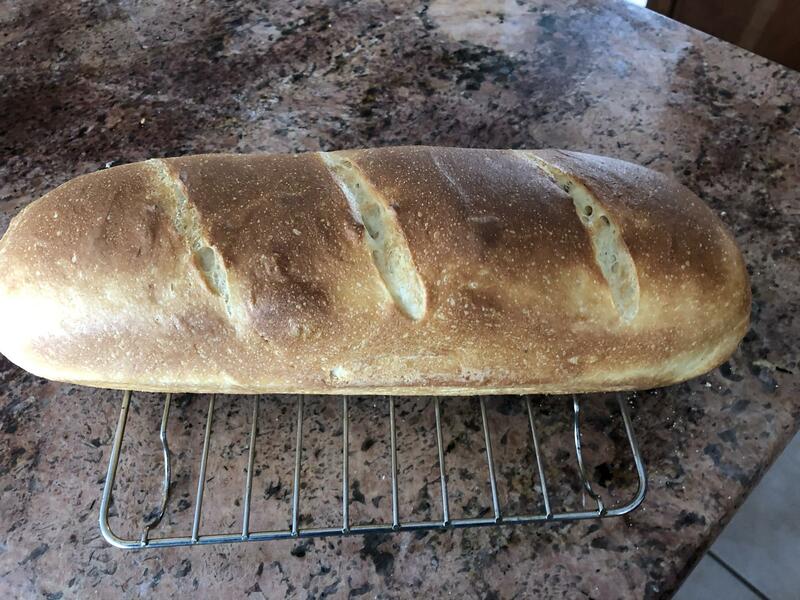 Of course, it's the only pain de mie recipe I've tried. I looked up this recipe and re-sized it by 2/3 to fit my 9” pan de mie. I'm currently out of white flour but should have some in a day or so. I"m eager to try it! I got a new covered baker from Amazon. 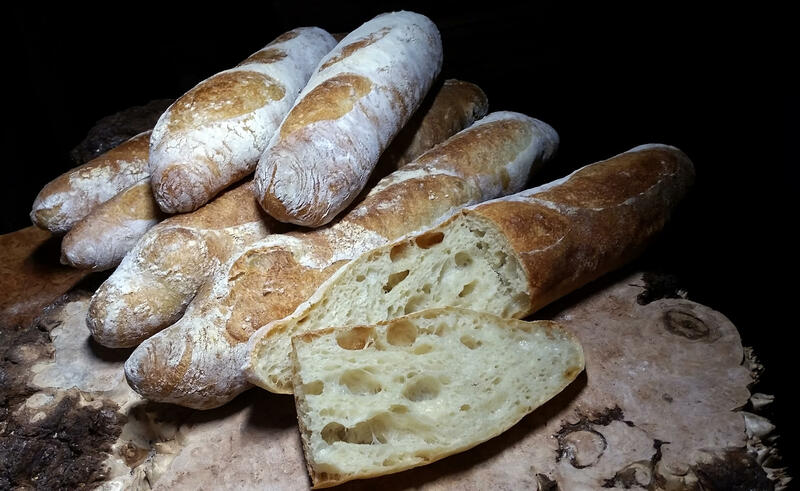 I've been having a baking frenzy lately; the winter weather makes me want to make bread and the aroma of fresh baked bread just makes me happy. I made eight Potato-Onion Rye Rolls yesterday and they are ever so good. I'll be having some ham and cheese and mustard on a roll for lunch today. 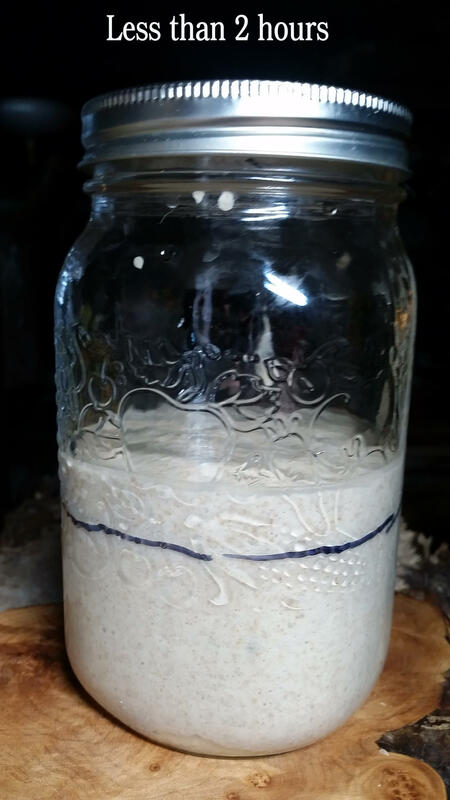 I made the dough last night for No-Knead Harvest Bread which I'll bake off later today. I hope I have enough room in the freezer for all this. The finished No-Knead Harvest Bread. Had to throw away my sourdough starter, it looked just too far gone to try to revive. No matter, thanks to KAF a new container is on its way, due on Tuesday. Looking forward to some good sourdough sandwich bread. 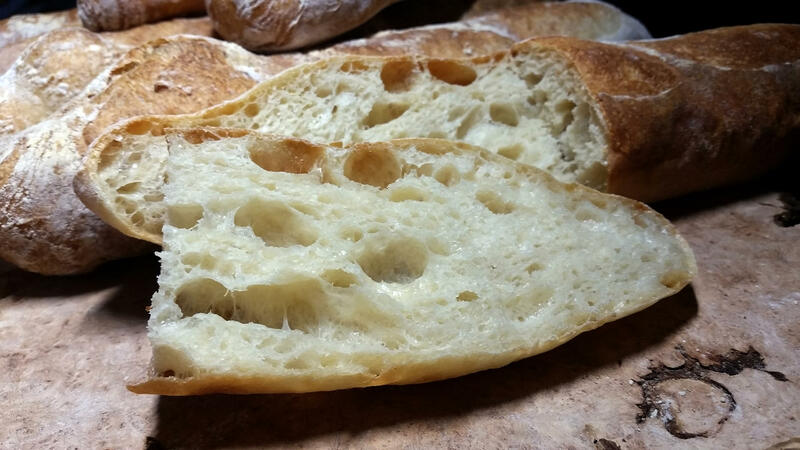 Today's Italian Hearth Bread (from KAF). I'm pretty impressed with the new covered baker! when I was cleaning out the fridge recently. 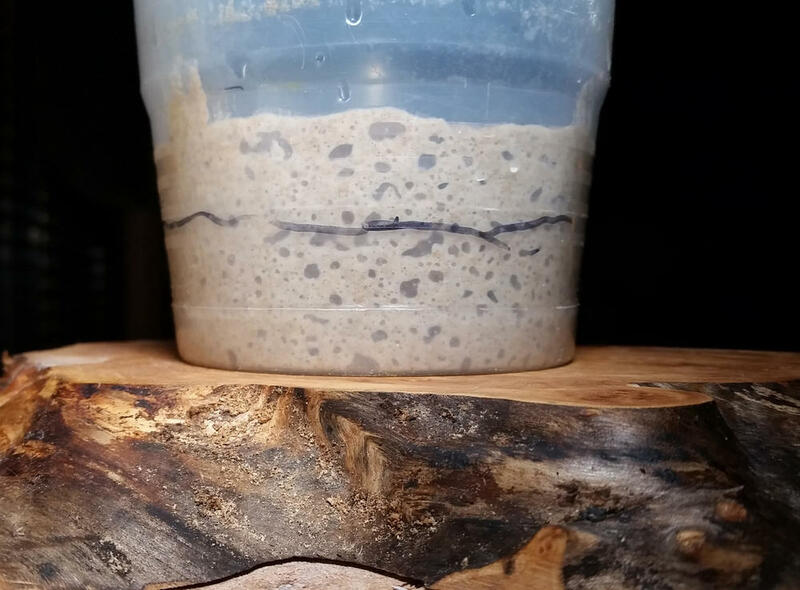 I use a local organic rye flour to grow the starter. I'm hoping it will be ready to use by the end of the week. and I decided to make and bake the same day. End up with 7 baguettes. The two smaller ones were baked in the CSO and the other five were baked in the Oster French Door oven. About to cut into tonight's creations. Three minutes on KitchenAid speed 4. Last week's loaves seemed a little over mixed. The one end is a bit wonky. Maybe one shouldn't do bread and taxes at the same time after all? Oh, wait, that was supposed to be bread and circuses. I'm working on a bread dough that may or may not develop the elasticity it needs. The recipe descriptions says to knead the dough until it is "elastic, tacky and smooth". I'm getting an upper body workout with it, and the tackiness is minimal. I used the minimum amount of flour prescribed in the recipe. 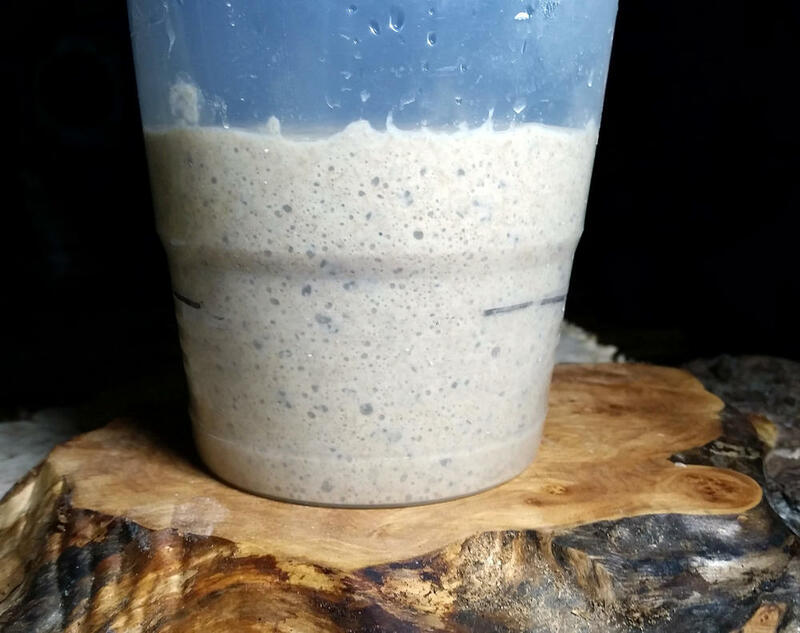 Now I'm wondering, as I let the dough rest to develop the gluten, whether I need to incorporate a bit more liquid. What's the best way to do that when the ball is already pulled together? Flatten it out and knead in water, a bit at a time? Edit: I've been spreading the dough out, poking dimples into it with my fingers as I would a foccacia, then dampening my hands and working the water into the dough. It seems to be working. For future reference, would there have been a better method? If you are going to add water, ( and you may have already thought of this) I would use a spray bottle. No, I didn't think of it. Thanks! I just ordered The Bread Bible by Rose Levy Berenbaum and it arrives tomorrow. I was surprised that when I used the "look inside" feature, it displayed page after page of this book including full recipes. Therefore, I was even more surprised that the Index was not. However, I know I will like the book so I went ahead and ordered it anyway. I made pita breads this afternoon. Not all of them developed a full puff. I turned on the gas stove and set the pita over the flame as is done to finish East Indian chapties. Worked really well to get a full puff and a nice bit of browning on the pitas. They need to go on the flame as soon as they are out of the oven. Who knew! 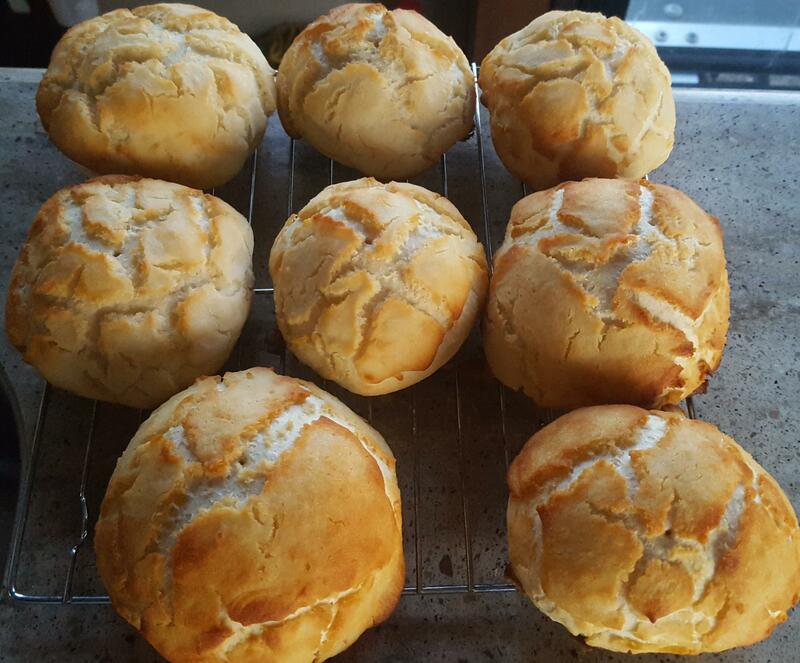 The aforementioned dough, that was much too stiff, became Dutch Crunch rolls before the day was out. They came out well, for a first try, but I had to make adjustments. I used the minimum amount of flour specified in the recipe, and still had to add water. That may have to do with the aridity in my current location. 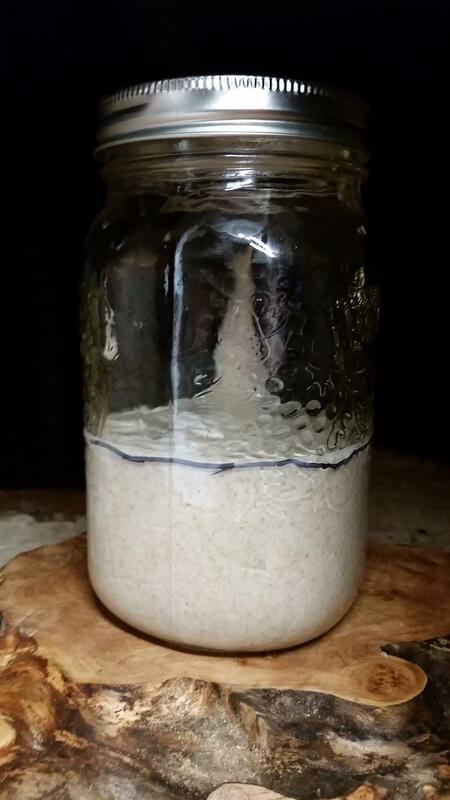 The same thing happened with the coating; the recipe begins with a certain amount of rice flour and water (and other ingredients) and suggests that more flour might be needed. I needed more water, instead. Pretty, aren't they? I just wish I'd had burgers to go with them. We'll have more opportunities before this batch is consumed. @Smithy, I use the stretch and fold method almost exclusively, with a 20 to 30 minute rest (autolyse ) in-between each stretch and fold. And I wet my hand well for each stretch and fold. So if your dough is on the dry side just be more generous with wetting your hand. That should work for you. Do you always use water, or do you sometimes use oil? In the Craftsy class I took with Peter Reinhart, which was an excellent launch for me, he suggests oiling the work surface and your hands for the stretching and folding. (The final shaping, after the initial proof, is done with a floured board and hands.) I wonder whether there are times to do this with water instead of oil. @Smithy I never use oil. Just water. But I'm doing all the stretch and folds in a large container. Not on a work surface. 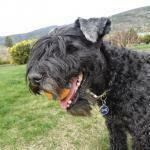 This is a blog post I did on it a few years ago. I made this yesterday. It is rye with about 25-30% of wheat. 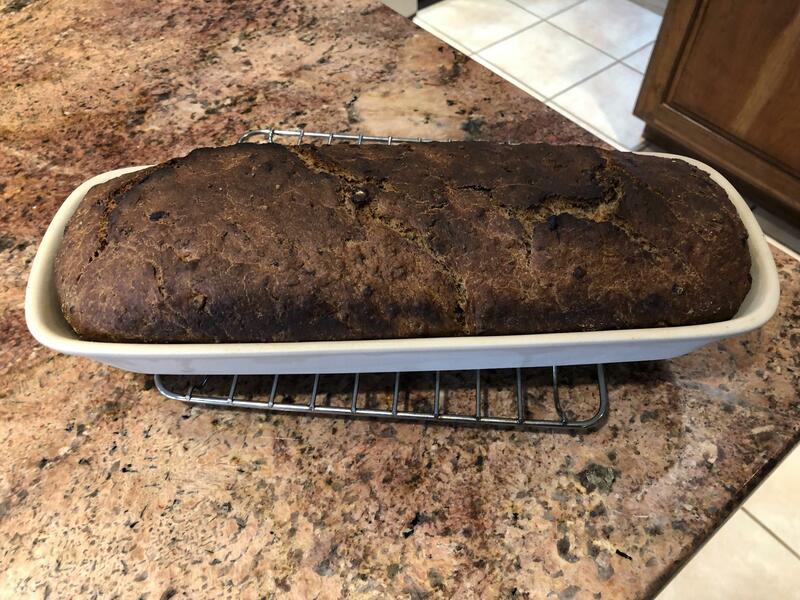 The recipe is based on the Russian Orlovsky bread. 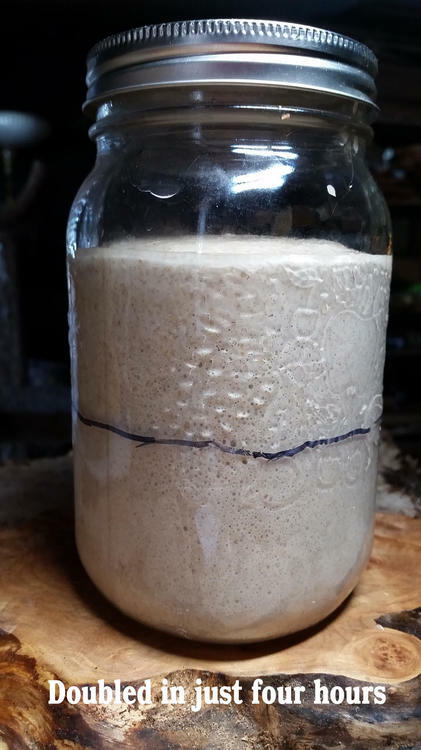 I used a starter that I grew myself, there is no factory yeast. I prefer it rise better than this, although, I am not sure if I can make it do that with my own starter. I used the dutch over technique that Chad Robertson describes in the "Tartine bread". 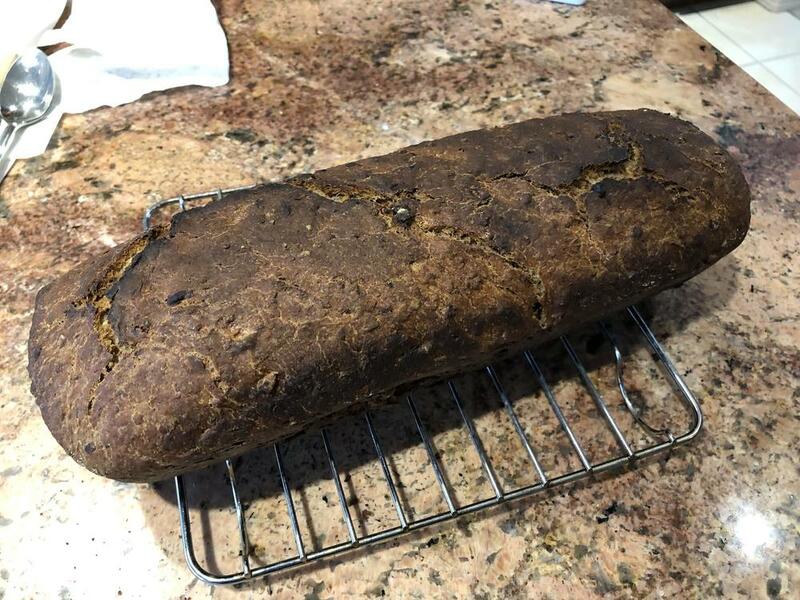 He uses it for wheat bread, and this one is rye, but this seems to work. The recipe that I used calls for rye grown in Europe, and the flour that I found here is different. I used a bit more water, and dough fermentation and proofing times are longer. 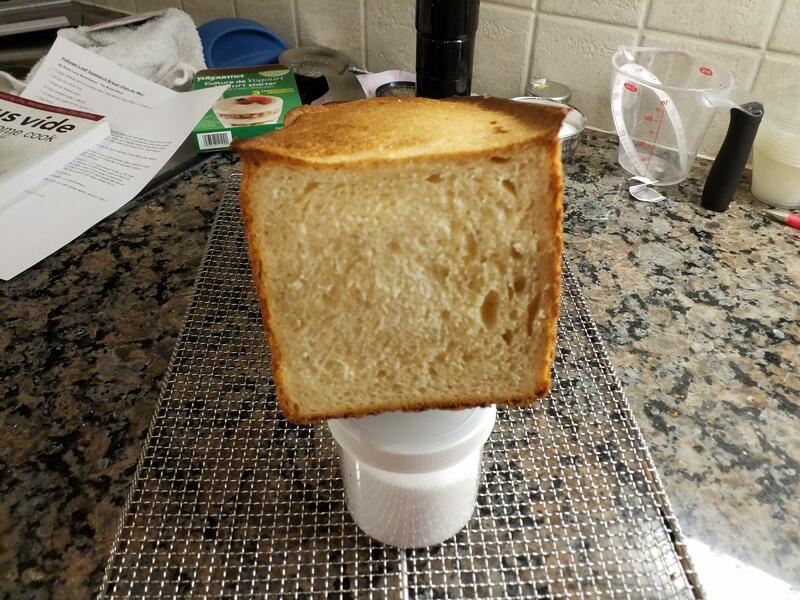 But I am new to baking and bread making, so maybe this is me, not the flour. Stage one - started Sunday night. and left until Tuesday morning when it had doubled in 36 hours. Stage Two - Fed again Tuesday morning. It had doubled again in just six hours. again it had doubled over night. Moved on to Stage Three this morning. 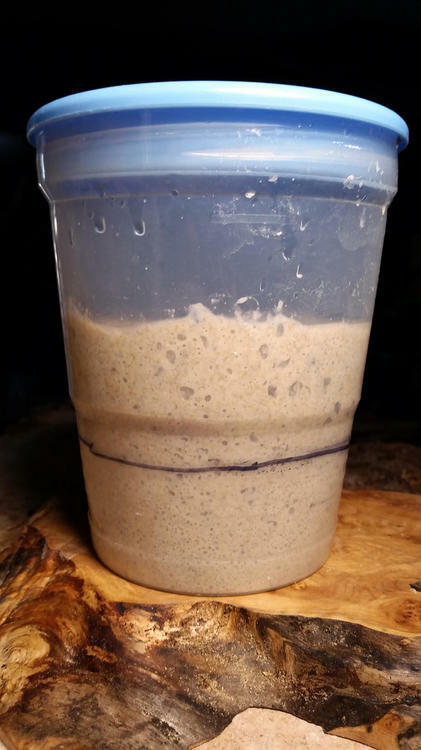 Fed 6 ounces of the starter with three ounces of spring water and three ounces of rye flour. It really took off and looked like this in less than two hours. And had doubled in four. I used 60g of the discard from Tuesday night's feeding and used it in a biga. 1000 g batch of dough bulk rising. Because the starter is so new, I also added just 1g of yeast. Moved on to Stage Three this morning.